Gosh I love it when our little Aussie super brand, Ulta3, comes up with the goods again. 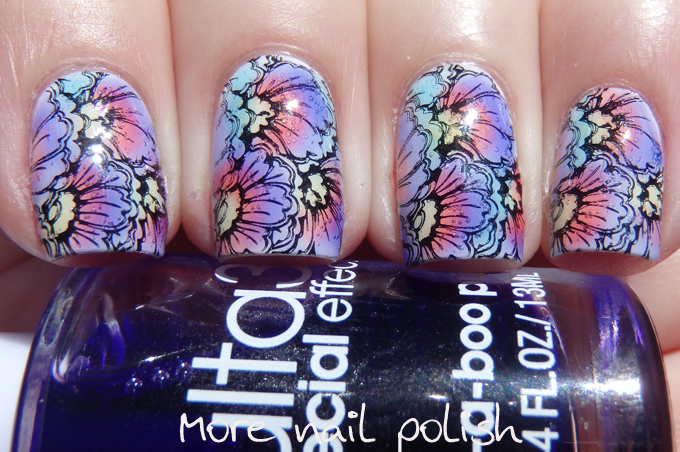 I'm really excited to share with you my thoughts about the brand new special effect watercolour polishes from Ulta3. These polishes will be available either individually ($2), or packaged as a set with Lily White ($10). 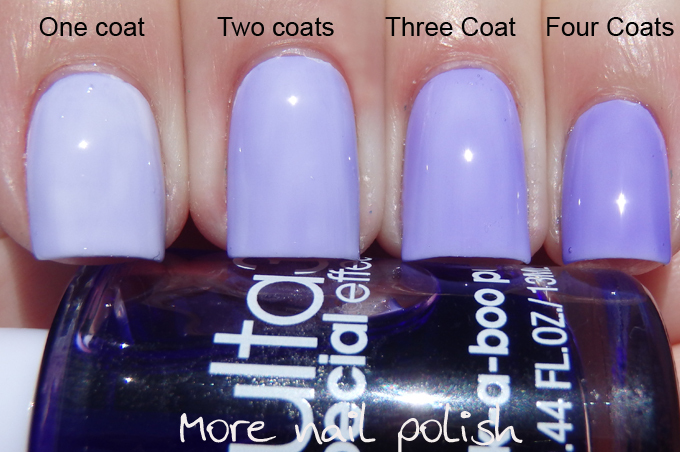 I have swatches of each of these shades, showing a single coat over white, two coats, three coats and four coats. As you can see, these are definitely sheer, and they are sheerer in colour compared to the OPI sheer tints. But the formula is really great. They aren't thick and gloopy, instead they are smooth and runny - but not water runny. Even at four coats, the finish isn't too thick and the dry time for each layer is good. At one coat, the coverage levels out nicely and the finish isn't streaky. We definitely are on a winner with these - especially at only $2 a pop! Cello yellow - a bright sunshine yellow in the bottle, but a soft pastel yellow over white. I wouldn't recommend this one without the white base, as it will just make it look like you have stained yellow nails. The palest of the shades and it doesn't show the building colour intensity as much as the other colours. Marine Blue - a deep sea aquarium effect in the bottle, but a soft pastel shade on the nail. The colour intensity builds quite nicely with this one. Peek-a-boo purple - a brilliant gemstone effect in the bottle, creating a soft purple shade on the nail. This one builds up nicely too. Seeing red - a bright toffee apple glaze effect in the bottle, creating a sheer coral finish on the nail. This one doesn't so the colour intensity as much at four coats. I have some ideas to show you how you can wear these, and here is the first. 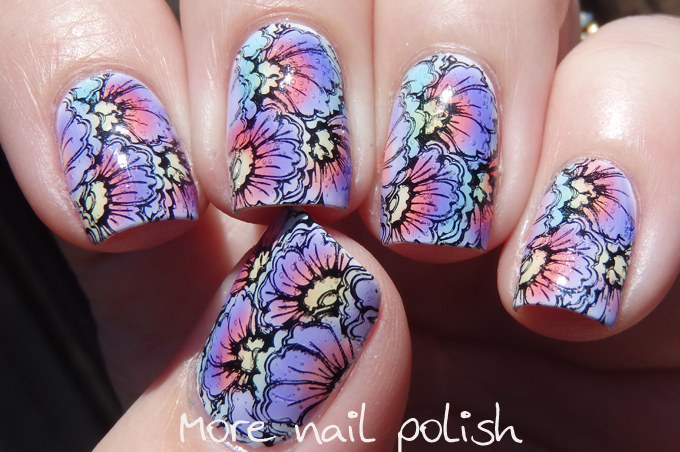 These watercolour effect polishes are just perfect to do leadlight technique. This look is really simple to create. 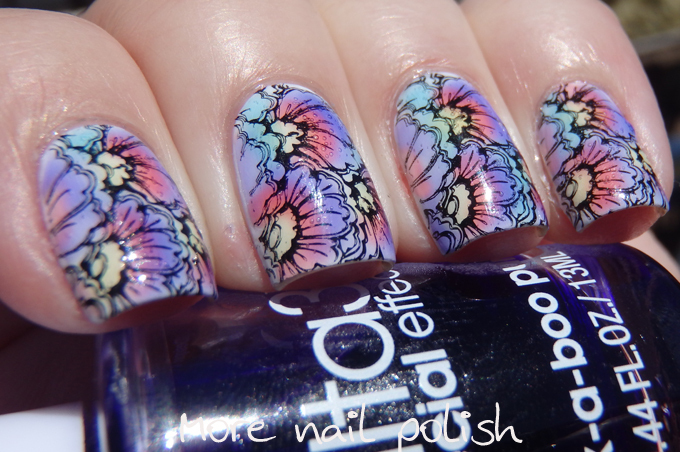 Use a dotting tool to apply the sheer tints to colour in the design. It doesn't matter that you go over the top of the black lines, because you wont be able to see it. 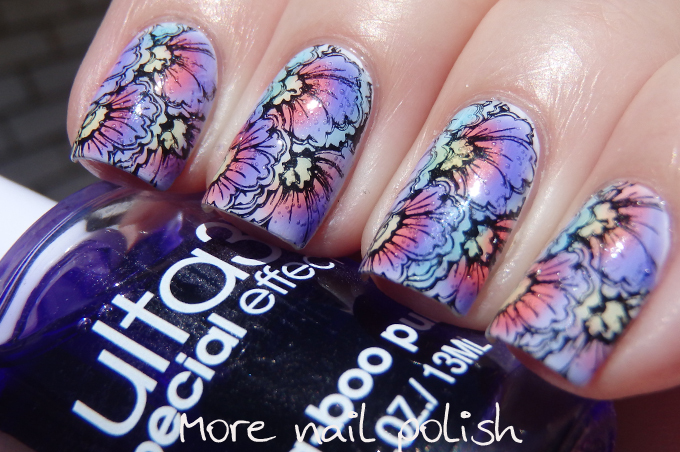 The Ulta3 Watercolour polishes will be available from selected pharmacies Australia wide, while stocks last. These are a limited edition, so if you like them, be sure to grab them. You can find your nearest stockist by using the Ulta3 stockist locator. You can also purchase Ulta3 online directly from the Heat Group,although I'm not sure if these LE polishes will be available there. So pretty! I've got try try this ! I so love this brand it's so cheap and so fun. Every now and then I get a bit frustrated about how expensive and hard to get international brands are. But then little brands like these and our gorgeous aussie indies are so cool and I'm so glad. Wow.. your manicure! So beautiful! 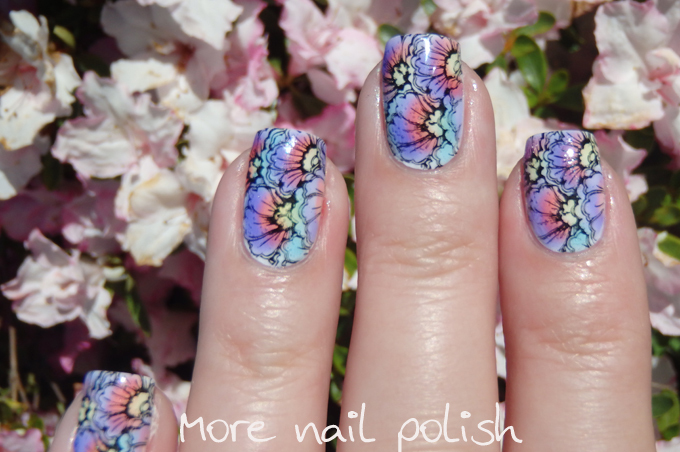 The stamping looks amazing, as your stamping always does :-) Which plate did you use?